Are there Ghosts at Woodlawn Cemetery? Woodlawn Cemetery in the Bronx was founded in 1863. Its 400 acres are easily accessible from Manhattan via trains from Grand Central Station, as well as by car using the Major Deegan (I-87) or I-95. The intention behind the location was to have a peaceful place away from the downtown noise, but not too far away. The original design of the cemetery was based on the “rural cemetery movement” that originated in 1831 with Mount Auburn Cemetery in Boston. However, five years after the cemetery opened, its design was changed to a “landscape lawn plan,” which prohibited fences and encouraged central monuments with footstones. The cleaner, more spacious grounds made cemetery maintenance much easier. A few of the 300,000 people interred at Woodlawn are mentioned in this book—people such as the Van Cortlandts, Herman Melville, and Olive Thomas Pickford. Other famous people buried there include George M. Cohan, Fiorello Henry LaGuardia, Nellie Bly, Joseph Pulitzer, and Thomas Nast. For those of you who appreciate retail shopping, F.W. Woolworth, Roland H. Macy, and James Cash Penney are buried there, too. Woodlawn offers many free events, such as concerts, walking and bus tours, theater performances, and a tree lighting during the holidays. It’s more than a cemetery; it’s a cultural resource for the Bronx. Photography is allowed in the cemetery as long as you stop by the office upon arrival, present a photo ID, and complete a simple form. I recommend you follow the formal steps in case you capture some amazing paranormal evidence and want to share it on your Web site or in a newspaper article. The cemetery grounds are open every day from 8:30 a.m. to 5 p.m., but the office, where photography permission is secured, is closed on Sundays. When I first visited Woodlawn, the ground was snow-covered and it was difficult to walk around; some of the drifts were more than three feet high. So I went back in early March of 2010 with Dina Chirico, my team leader at the New Jersey Ghost Hunters Society. Dina is a great navigator, which helped tremendously; she read the map and directed me while I drove. The first grave I was determined to find was that of Herman Melville. What writer could refuse the chance to pay respects to one of the greats? I certainly couldn’t. 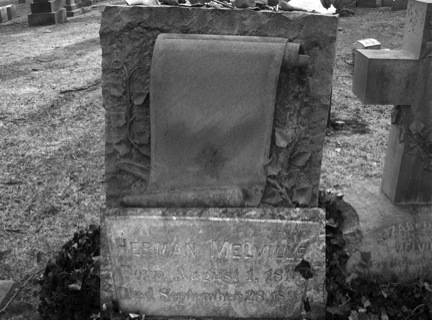 According to the map, Melville’s grave was located in the Catalpa section of the cemetery. We drove over to it and parked. Dina and I employed a “divide and conquer” strategy to find the grave: she started at one end of the section, and I went to the other. I had my digital audio recorder running the whole time I was searching. I noted on the recording the date, time, and weather; I also took some photos while searching. As I started up a small incline, I saw what appeared to be a baby’s grave. I said into my recorder, “a little . . . it looks like a little baby grave. Born January 2, 1871, died . . . I can’t make out the month . . . seventeenth of 1872.” When I reviewed the recording, right after I said, “looks like a little baby grave,” I heard the voice of a woman whisper, “Yeah.” I know it’s not my voice because I was speaking at a normal conversational volume, and the EVP interjects so closely after my previous word, it’s impossible that I could have said it. I know it’s not Dina’s voice, either; she was so far away from me at the time that she had to yell to ask if I had found Melville’s grave yet. I shut the recorder off so I could yell back to her that I hadn’t. I didn’t know I had captured an EVP until I got home and reviewed the recording. Dina and I reconvened at my car and reviewed the map once more. She knew we were close to Melville’s grave, and she became even more determined to find it. We started out again, and Dina found it. Honestly, I was expecting a huge monument for someone like him, but it was a simple, modest headstone. Little rocks and trinkets left by previous visitors sat atop the headstone. There was also a handwritten note that said, “Thanks. You changed my life.” Dina and I waited quietly around Melville’s grave for a bit, recording for EVPs. 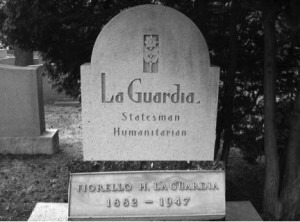 Then we left to find LaGuardia’s grave. Fiorello LaGuardia was mayor of New York City from 1934 to 1945. He was a short, rotund man with a high-pitched voice, but full of fire and conviction. He did not like the shame and negative stereotypes the mob had brought to Italian culture. LaGuardia put it best when he said, “Let’s drive the bums out of town.” He had Lucky Luciano arrested, and he went after Frank Costello’s slot machines with a sledgehammer. It was a media event when the slot machines were dumped onto a barge to be taken away from New York City. Dina and I found LaGuardia’s grave much more easily than Melville’s. By then it was getting late, and we couldn’t hang around to conduct an EVP session. Dina took some pictures of the grave before we left the cemetery. Judging by how effortlessly I captured an EVP while walking around Woodlawn Cemetery, I am sure there are more to be found on a return trip. I wonder what Joseph Pulitzer, “father of journalism,” has to say these days.